Welcome to another fun collaboration with some fellow fashionable bloggers! I love these. It’s been so fun to see how we all take an item of clothing or an idea, and turn it into an outfit. I’ve gotten so many outfit ideas from these ladies and it’s helping me to come up with new ways to style items I already have. Today we’re giving you some ideas for a white jeans outfit for summer. 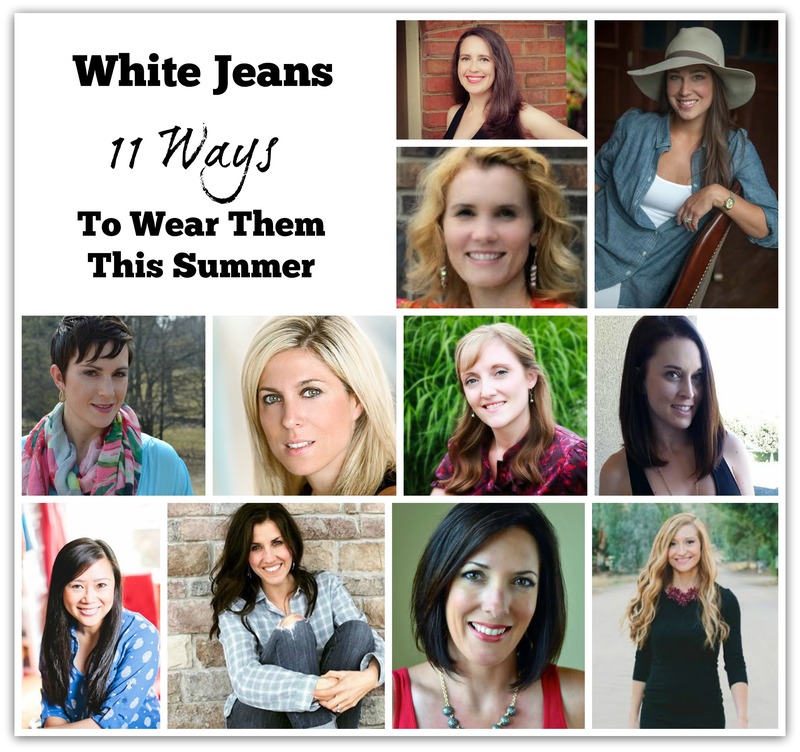 If you’re needing some ideas for how to style your white jeans, you are in for a treat! Enjoy! 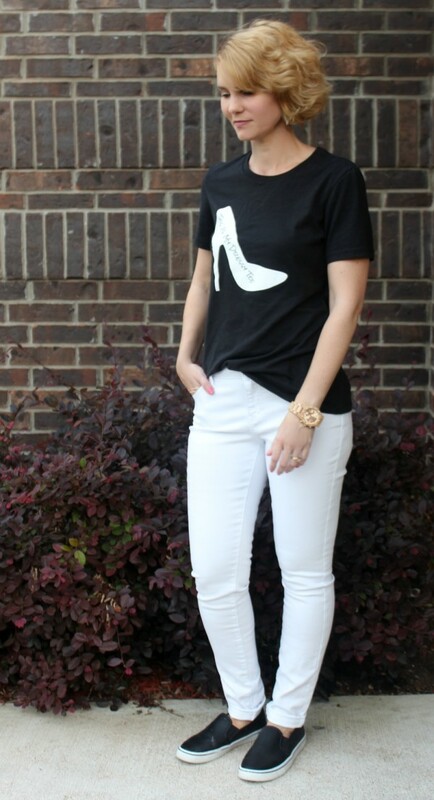 I decided to show you how I would style my white jeans two ways – one dressy and one casual. First up…dressy! 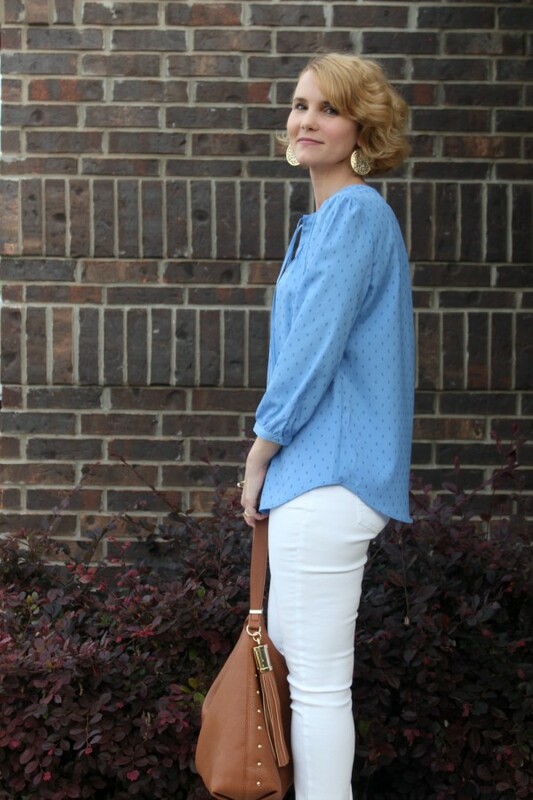 I think what I like most about white denim is how they help a blouse pop! 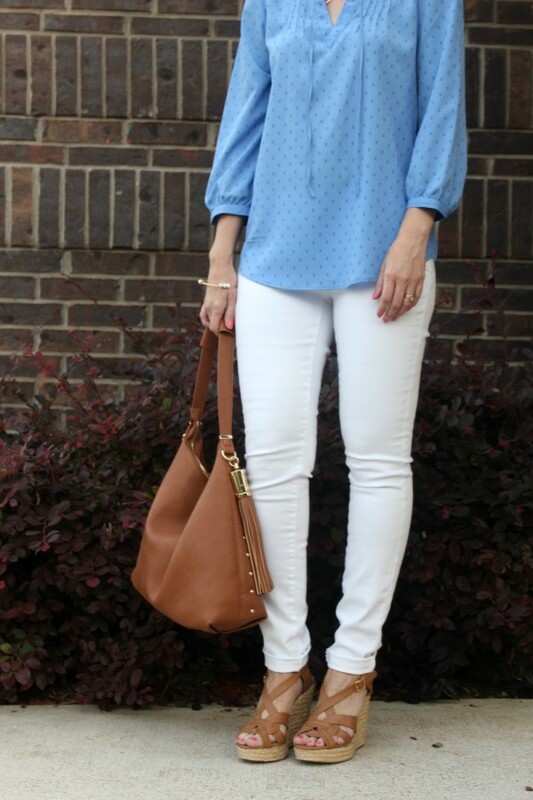 This soft blue top from Kohl’s really stands out when styled with white denim, as opposed to if I wore it with blue jeans. Think of some blouses in your closet that are pink, green, blue, yellow, mint – I could go on – and picture them with white denim. It’s such a gorgeous, easy outfit idea to put together. The outfit I’m wearing is very simple: a blue top, white denim, brown wedges and brown handbag. Add in some jewelry and voila! – you have a great outfit. Now for the casual outfit. For my casual outfit, I switched out the dressy top for This Is My Dressy Tee from That Chic Mom Tees. 🙂 I told you I’ve been getting a lot of wear out of this great t-shirt! I also swapped out the wedges for my black sneakers. I really like wearing black and white outfits – whether it’s white denim and a tee like this one, or a black and white maxi dress. It’s a classic, you-just-can’t-go-wrong combination. Do you have a pair of white jeans? If not, do you want a pair now? 😀 Let me know how you would style your white denim and don’t forget to visit the other bloggers for more fabulous style ideas! Both outfits are super cute! I love that blue and white combo with the brown shoes and bag, though. GORG! I love both outfits but I am must say i am partial to that tee! Thanks for featuring it again and you look great! Both looks are too fabulous! Love those wedges! Super cute, I love the graphic tee look!!! love BOTH…but I really adore the wedges and the chambray top- great minds think alike and I just feel like you cannot BEAT white with denim?! Hope you have an awesome weekend girlie.